刘超, 黄钰豪, 陆元春. 新老桥间超高性能混凝土拼接接缝性能试验[J]. 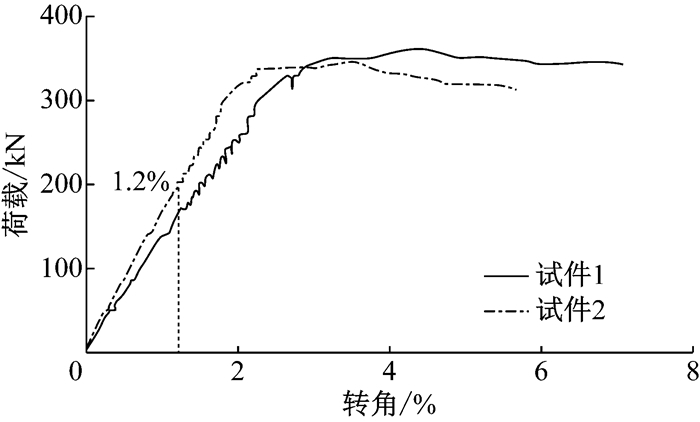 同济大学学报(自然科学版), 2019, 47(3): 322-330. 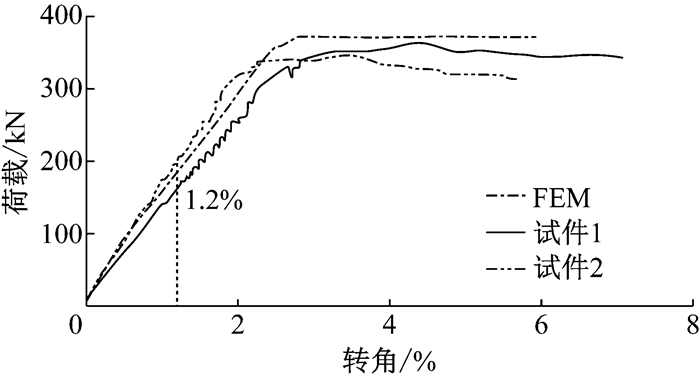 DOI: 10.11908/j.issn.0253-374x.2019.03.004. 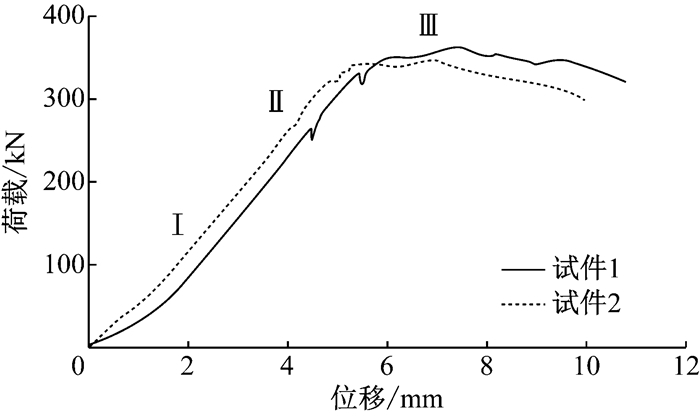 Abstract: Based on the bridge-stitching project of Jiyang viaduct, Shanghai, an experiment was conducted on high-strain hardening ultra-high-performance concrete (UHPC) stitching joints. 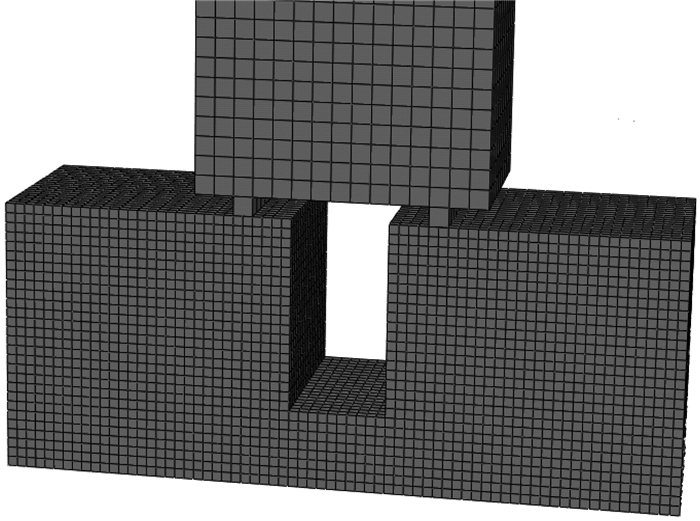 Asymmetrical loading was used to simulate the bridge uneven settlement in the experiment. 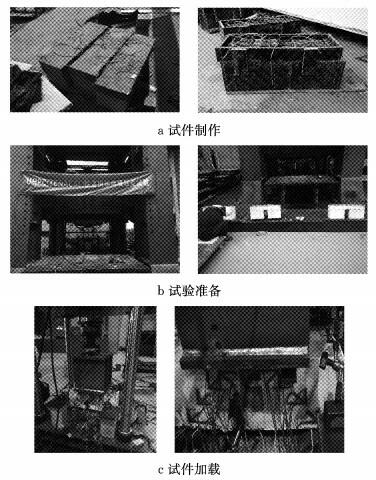 The experiment results show that the entire process can be divided into three stages: elastic stage, cracks developing stage and failure stage. 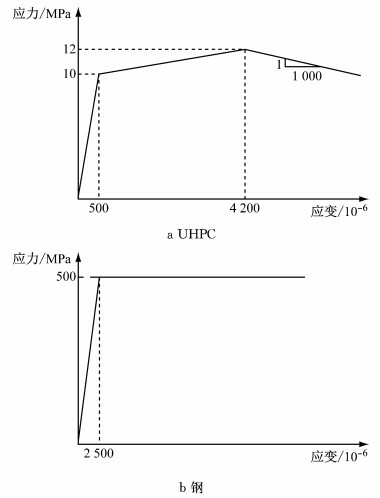 First, cracks appear under the UHPC panels; then, many micro cracks appear on the side of the UHPC panels. The cracks appear in the form of micro-crack clusters, and the crack width slowly increases. 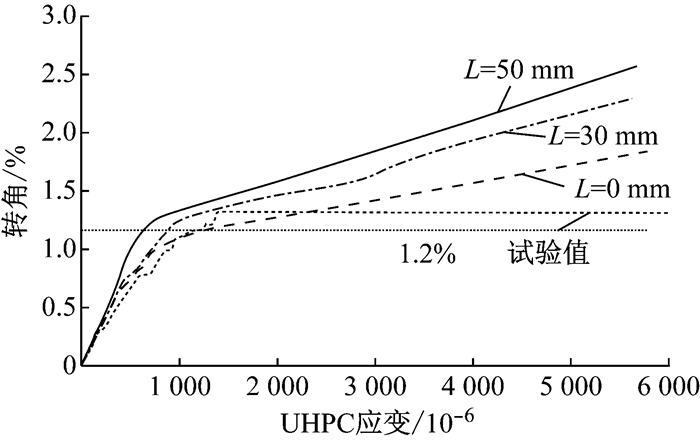 When the UHPC panel rotation is 1.2%, the crack width is 0.16 mm, so the UHPC has excellent crack-control ability. 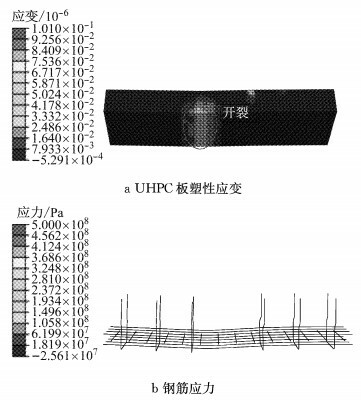 In the end, the main crack appears at the bottom of the UHPC panels, and the transverse reinforcements yield because the reinforcement layout satisfies the requirements of the failure mode of the specimen. Thus, the reinforcement arrangement of the specimen is reasonable. 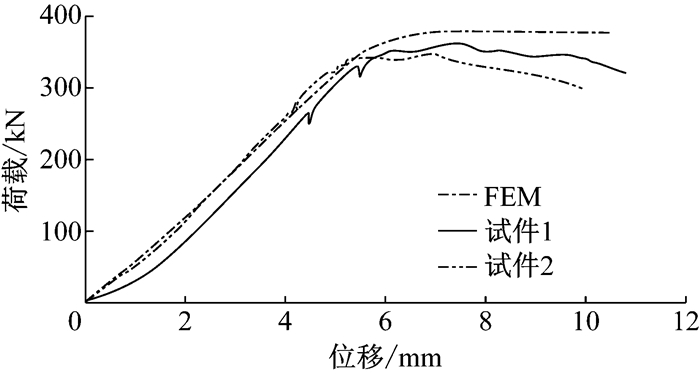 The experiment was simulated using the finite-element model, and the results were coordinated with experiment results. 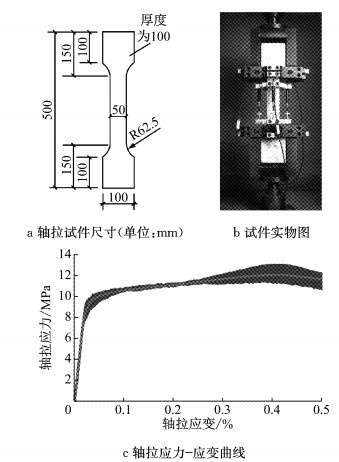 The parameter analysis was carried out by the finite element method, and the results show that increasing joint free length and reducing joint thickness can effectively enhance the bending performance of joints. 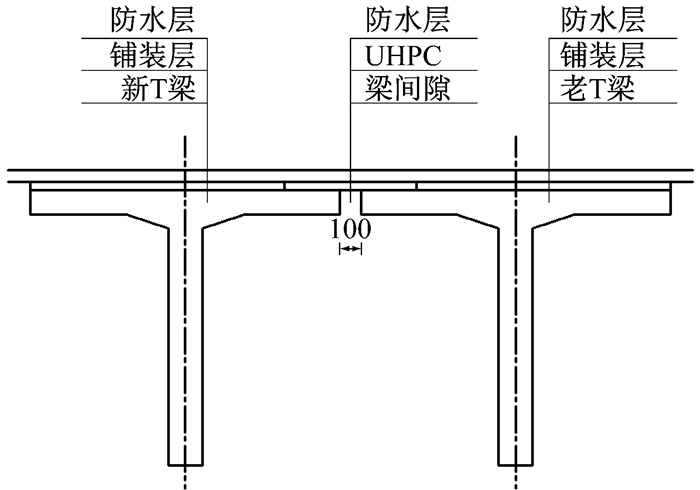 Because the advantages of the UHPC joint are convenience, rapidity, and excellent performance, a joint form based on the type of non-connection of upper and lower structures is put forward. 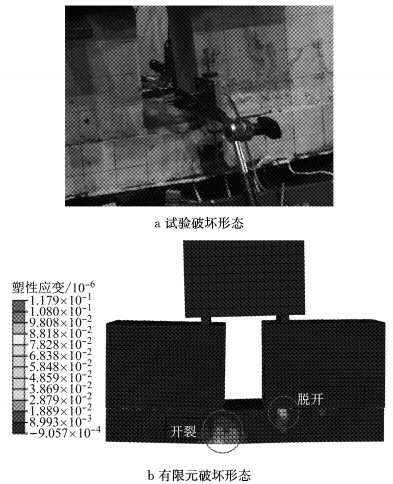 What's more, a detailed reinforcement scheme is given, which will serve as a reference for similar projects in the future. 上海市济阳路高架的部分路段拓宽拼接工程，采用桥面铺装层连接方案，目的是保证拓宽桥面的行车平顺性，新老T梁靠近的两翼缘间距为100 mm.新老桥拼接的相对沉降导致拼缝处受力复杂，要求拼缝材料具有很好的变形性能和抗弯曲能力.由于UHPC具有出色的变形性能，强化阶段极限拉应变可以超过3 800×10-6，上部结构的纵桥向拼缝采用80 mm厚的UHPC薄板.设计的控制指标为新老桥相对沉降值小于10 mm，偏安全地按照10 mm的相对沉降值计算接缝处转角约为1.2%，故新旧桥梁纵向拼接接缝的基本要求为：接缝在达到1.2%转角时，裂缝宽度不超过0.2 mm，且裂缝不贯穿UHPC.工程示意图见图 1，现场照片如图 2所示. 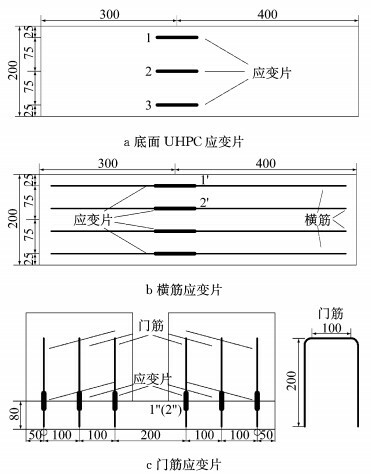 试验材料采用的应变强化UHPC基于最紧密堆积原理由计算机精确设计，可将宏观缺陷降到最低，形成高度致密的无机质基体.在常温养护条件下，具备超高强、应变强化、高耐久性、优异的施工性能.本试验采用的UHPC密度为2 600 kg·m-3，弹性模量约为50 GPa，泊松比为0.2，极限抗拉强度为12 MPa，强化阶段极限拉应变为3 800×10-6，极限抗压强度为150 MPa.参考Lampropoulos等的试验，轴拉试件为狗骨头形，测试段尺寸为50 mm×100 mm×500 mm，轴拉试件见图 3a、3b，轴拉试验曲线见图 3c.试验试件及现场加载见图 4.同时，对本试验所采用的同一批次的钢筋进行了材性试验，抗拉强度为500 MPa. 对全桥构造缩尺模型显然不是经济的办法，在保证准确性的前提下，又兼顾经济性，设计如图 5所示的试验模型，图中F代表加载力.这种试件设计可以让UHPC板充分受弯，更好地利用其变形性能，从而利用转角控制设计状态.图中，中间2个尺寸为长300 mm、宽200 mm、高250 mm的C50混凝土块模拟新老桥的翼缘，下部UHPC薄板尺寸为长700 mm、宽200 mm、高80 mm，模拟UHPC拼缝.采用非对称加载，加载比例为3:7，目的是模拟新老桥不均匀沉降造成的受力不均.为防止局部应力集中，加载时两边各预留50 mm.在横筋、纵筋、门筋和UHPC板底部设置应变片，UHPC与钢筋应变片布置如图 6.UHPC板内布置双排横筋 16@50、单排纵筋 10@50.同时，为了保证UHPC板有良好的连接性，在C50和UHPC板间增设门筋 12@100，钢筋布置图见图 7. 图 10为两试件的荷载-转角曲线，在加载初期，位移与荷载呈现很好的线性关系，在达到1.2%转角时，试件1和试件2荷载约为170 kN和200 kN，此时UHPC板出现裂缝，裂缝宽度均为0.16 mm左右.之后随着荷载的增加，结构逐渐进入塑性，结构的极限荷载分别为363 kN和346 kN. 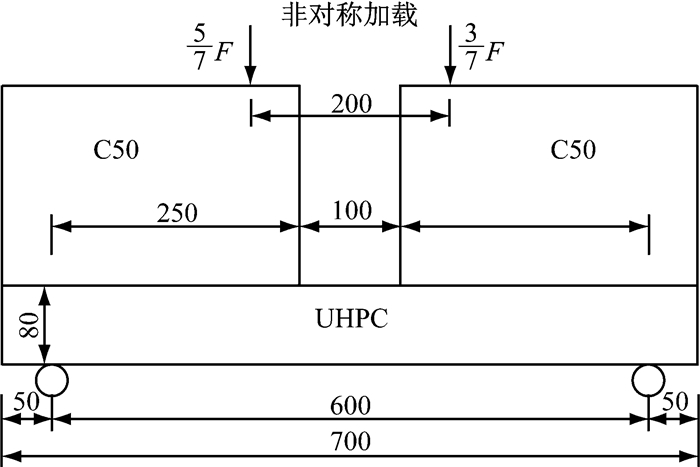 高应变强化型UHPC材料有着类金属的非线性特点，利用ABAQUS软件建立UHPC拼缝模型进行有限元仿真，模型示意图如图 13所示.模型中尺寸完全根据试验确定.模型中采用的材料为钢、C50混凝土和UHPC，由于C50混凝土仅仅为了传力，而不是重点研究对象，为了计算收敛，将其应力应变关系设置为全过程线弹性，钢和UHPC则设置非线性，本构关系见图 14.混凝土弹性模量为34.5 GPa，钢的弹性模量为210 GPa，UHPC弹性模量为50 GPa.C50和UHPC间接触设为硬接触.同时，定义C50混凝土、UHPC和钢为各向同性材料.模型网格划分采用扫略划分，C50块和UHPC板均采用空间六面体C3D8网格，钢筋采用桁架单元，共计6 896个节点，5 126个单元.各参数设置见表 2. 考虑到某些地基土质较差的地区相对沉降可能较大，在UHPC接缝和T梁翼缘间加橡胶，使UHPC和主梁分离，从而使UHPC达到更佳的弯曲能力.如图 19所示，保持其他参数不变，取橡胶厚度为20 mm，长度分别为L=0 mm(实际试验参数)、L=30 mm、L=50 mm，进行有限元模拟，并将结果与试验结果进行对比.由于工程重点看重在一定转角下UHPC的工作状态，故绘制转角-UHPC应变曲线于图 20，UHPC应变取UHPC板中下缘最大应变. 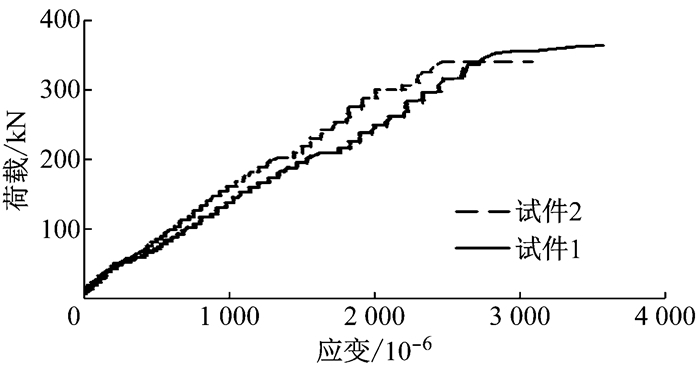 从图 20可以看出，L=0时自由长度曲线结果与试验吻合得较好，试验数据在应变1 800×10-6之后为水平段是因为应变片处突然开裂所致.在相同转角下(试验规定的最大转角为1.2%)，L=50、30、0 mm时，UHPC应变分别为520×10-6、770×10-6和1 180×10-6.随着转角的增加，在相同转角下，UHPC的应变由小到大分别为：L=50 mm时、L=30 mm时、L=0 mm时.从原理上考虑，随着自由长度的增加，跨中UHPC的刚度减小，刚度减小有助于提高UHPC的弯曲性能.因此，自由长度的增加有利于提高UHPC接缝的弯曲能力. 考虑UHPC接缝厚度对其弯曲能力的影响，如图 21所示，保持其他参数不变，变量取定为UHPC接缝厚度，分别在对照组厚度H=80 mm(实际试验参数)、H=100 mm、H=120 mm情况下进行有限元模拟，并将结果与及试验结果进行对比.由于工程重点是在一定转角下UHPC的工作状态，故绘制转角-UHPC应变曲线于图 22，UHPC应变取UHPC板中下缘最大应变. 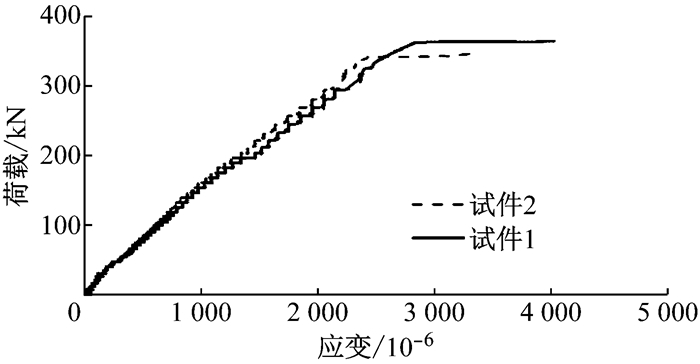 从图 22可以看出，在相同转角下(试验规定的最大转角为1.2%)，接缝厚度H=8 mm、H=10 mm和H=12 mm的UHPC应变分别为1 180×10-6，3 130×10-6和5 110×10-6.随着转角的增加，在相同转角下，UHPC的应变由小到大分别为：H=8 mm时、H=10 mm时、H=12 mm时.从原理上考虑，本工程接缝属于柔性接缝，需具备优异的弯曲能力，增加UHPC接缝厚度，即增加了跨中UHPC的刚度，不利于UHPC的弯曲.可见，接缝厚度的增加不利于UHPC接缝的弯曲能力. PERRY V H, SEIBERT P J. 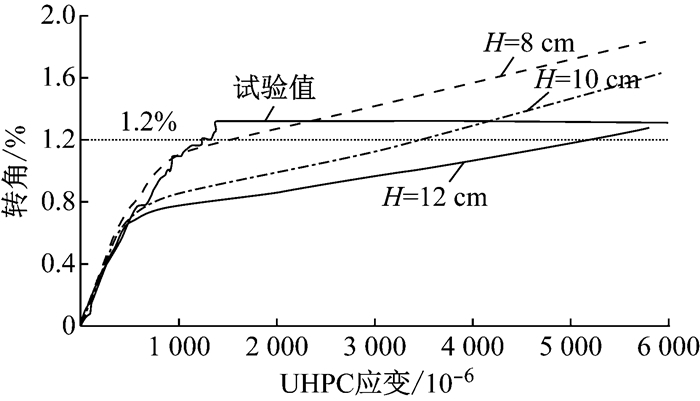 The use of UHPFRC (Ductal®) for bridges in North America: The technology, applications and challenges facing commercialization[C]//Proceedings of Second International Symposium on Ultra High Performance Concrete. Kassel: University of Kassel, 2008: 815-822. 中华人民共和国住房和城乡建设部.混凝土结构设计规范: GB 50010—2010[S].北京: 中国建筑工业出版社, 2010. Ministry of Housing and Urban-Rural Development of the People's Republic of China. Concrete structure design code: GB 50010—2010[S]. Beijing: China Architecture & Building Press, 2010.